Kodiak Island, Alaska - August 7, 2010, a group of pilgrims from Russia led by Archbishop Justinian of Naro-Fominsk, administrator of the Patriarchal Parishes in the USA, and pilgrims from the USA led by the Primate of the Orthodox Church in America, His Beatitude Metropolitan Jonah came to Kodiak Island. They visited the local museum of history arranged in the house of Alexander Baranov (1746-1819), an explorer and the first governor of the Russian America. 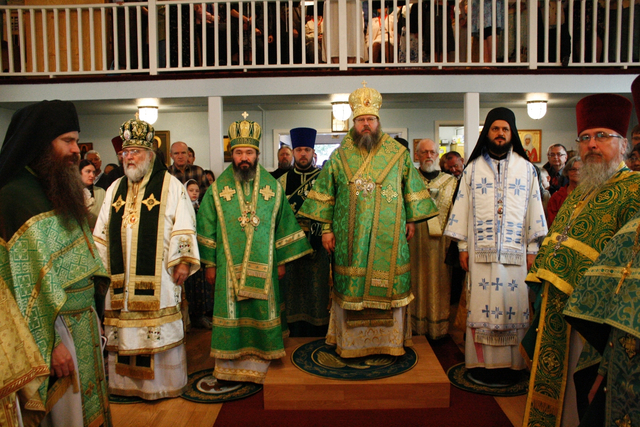 On Saturday evening, Metropolitan Jonah, Archbishop Justinian, Bishop Veniamin, temporary administrator of the Diocese of Alaska (Orthodox Church in America), and Bishop Maxim of Western America (Serbian Orthodox Church) celebrated All-Night Vigil at the church of the Resurrection on Kodiak Island, where the relics of the Venerable Herman of Alaska repose. On August 8, the archpastors celebrated the Divine Liturgy at the same church. Among the worshippers were numerous pilgrims from Russia, who prayed and communicated. After the service, the pilgrims visited St. Herman’s Seminary, which trains clergy for the northern dioceses of the Orthodox Church in America.